Nine of us met at the Leisure Centre at 10.30 and we collected another two ” en route”. 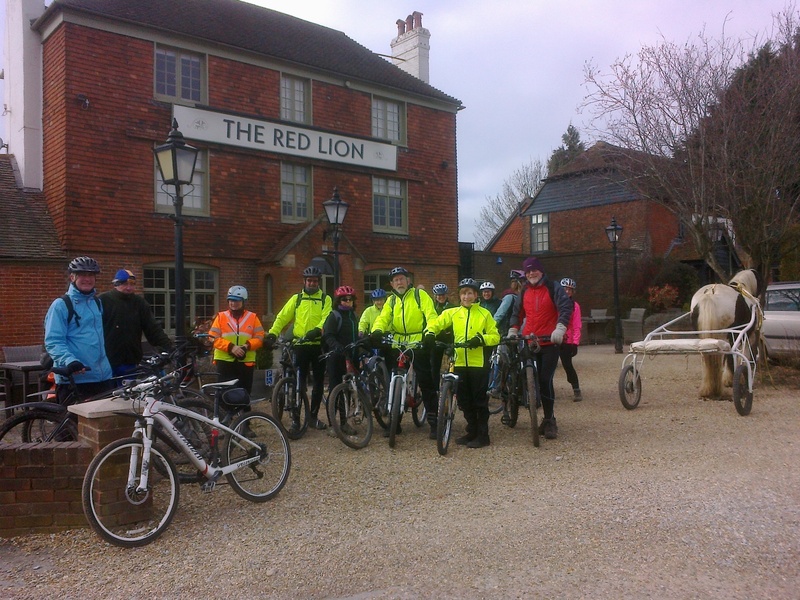 We took a cross country route going via Partridge Green, Lock’s Farm, Dial Post and The Countryman Inn (for coffee) and then continued towards Storrington and Washington before arriving for lunch at The Red Lion, Ashington. Another 3 intrepid cyclists met us for lunch, one having cycled from Brighton to meet us, so we were 14 for a very welcome and delicious lunch. We returned to Henfield via Spithandle Lane and West End Lane having braved the rather deep mud near the river!! By the time we all went our separate ways at The Cat And Canary most of us had completed a 26 mile bike ride. Our next trip is scheduled for April 6th to the Eight Bells at Bolney.